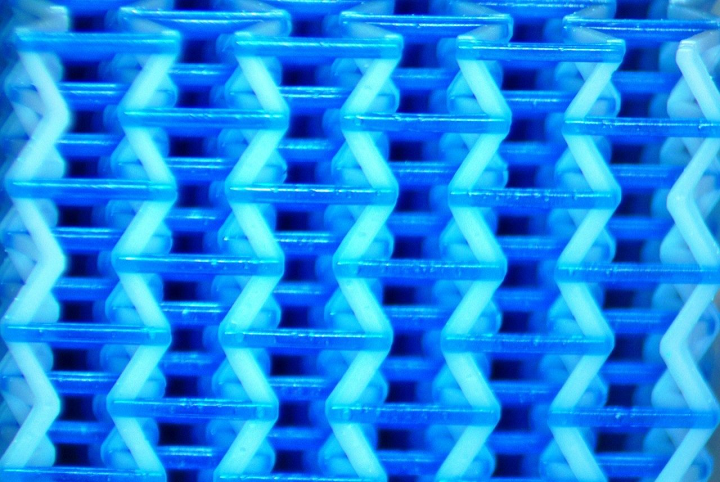 University of Michigan researchers have developed a new vat polymerization 3D printing technique that produces objects at up to 100 times faster than current 3D printing techniques, as detailed in a paper entitled “Rapid, continuous additive manufacturing by volumetric polymerization inhibition patterning.” 3D printing has not yet fully lived up to its potential as a small-batch production method because it, particularly FFF 3D printing, just hasn’t been fast enough to meet typical production schedules of a week or two. “Using conventional approaches, that’s not really attainable unless you have hundreds of machines,” said Timothy Scott, University of Michigan Associate Professor of Chemical Engineering who co-led the development of the new 3D printing approach with Mark Burns, the T.C. Chang Professor of Engineering at the University of Michigan. Their technique uses two lights to control where the resin hardens and where it remains fluid, allowing them to solidify the resin in more intricate patterns. They can make a 3D bas-relief in one shot rather than in multiple layers. The researchers’ approach overcomes limitations of earlier vat polymerization 3D printing efforts. In particular, the resin would tend to solidify on the window that the light shone through, halting the print job. An early solution was a window that lets oxygen through, stopping the solidification and leaving a film of fluid that allows the printed object to be pulled away. Because this gap is so thin, however, the resin must be highly liquid in order to flow between the newly solidified part and the window as the part is pulled up. This has limited vat 3D printing to small, relatively fragile products. But by replacing the oxygen with a second light to stop the solidification process, the Michigan researchers were able to produce a much larger gap between the object and the window, allowing resin to flow in thousands of times faster. By creating a relatively large region where no solidification happens, thicker resins – some with strengthening powder additives – can be used to 3D print more durable objects. The technology also circumvents one of the biggest issues of FFF 3D printing, which is poor layer adhesion and subsequent weakness. In existing systems, there is only one reaction – a photoactivator hardens the resin wherever the light shines. In the University of Michigan system, however, there is also a photoinhibitor, which responds to a different wavelength of light. Rather than just controlling solidification in a 2D plane, the researchers can pattern the two kinds of light to harden the resin at practically any 3D place near the illumination window. The University of Michigan has filed three patents for the technology, and Scott is working on launching a startup based around it. This new approach could be a huge step for 3D printing, allowing it to be used much more effectively in production settings. Authors of the paper include Martin P. de Beer, Harry L. van der Laan, Megan A. Cole, Riley J. Whelan, Mark A. Burns and Timothy F. Scott.